Innovative playable and expressive musical instrument. Fresh beautiful tones with a distinctive character. Samples of 12 guitars harmonics as a sound source. Advanced synthesis engine. Noise-shaper section for vintage analog style sounds. Dual layer capability. Expanded effect section with Various traditional and special effects: Rotator, Granular effect, Chorus, Delay, Reverb, Magic effect, Distortion.Lowpass, Bandpass, Highpass. Magic Vox uses the beautiful sonic qualities of guitar harmonics (Flageolets). Rotator: Smooth and beautiful effect that accurately emulates a rotary speaker. Granular: Uses granular synthesis techniques for the creation of sound clouds and other special effects. Magic: Has two modes: white magic for a gentle magical touch, and black magic when you a wild reaction is needed. Chorus: Traditional chorus sound. Has a special extreme mode that enable you to add metallic flavor to the sound. Distortion: 3 modes of distortion are available: Booster, Rectifier and Crusher. The distorted sound can be passed through a dedicated resonant filter for special distortion effects. Delay: Advanced delay with a resonant multimode filter, for coloring the delayed sound. Reverb: The reverb unit is being used as a send effect, so you can add reverb to each of your two sound sources independently. Qweas is providing links to Magic Vox VST 1.01 as a courtesy, and makes no representations regarding Magic Vox VST or any other applications or any information related thereto. Any questions, complaints or claims regarding this application Magic Vox VST 1.01 must be directed to the appropriate software vendor. 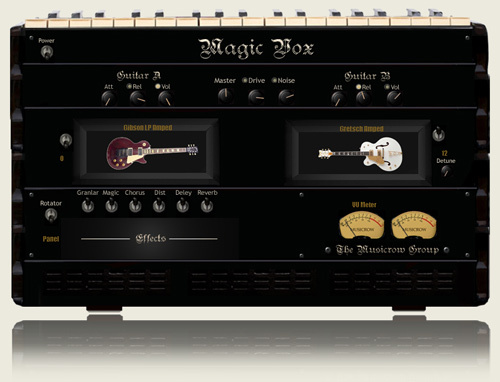 You may click the publisher link of Magic Vox VST on the top of this page to get more details about the vendor.